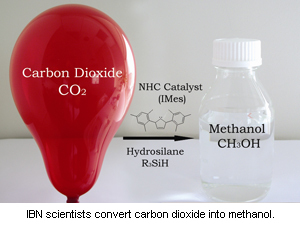 The team made the carbon dioxide react by using N-heterocyclic carbenes (NHCs), their novel organocatalyst. Compared to heavy metal catalysts that usually contain toxic and unstable components, NHCs are stable, even in the presence of oxygen. That makes reactions with NHCs and carbon dioxide possible under mild conditions in dry air. The press release explains that organocatalysts are catalysts, comprised of non-metallic elements, found in organic compounds. NHCs such as IMes (1,3-bis-(2,4,6 trimethylphenyl)imidazolylidene) are a form of organocatalysts that are stable and easily stored. They do not contain toxic heavy metals and can be produced easily without high costs. 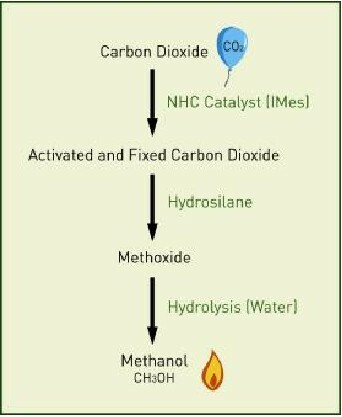 CO2 to Methanol Process. Click image for more. It’s a big breakthrough, as previous efforts to reduce carbon dioxide to more useful products have required more energy input and a much longer reaction time. Previous efforts also required transition metal catalysts, which are both unstable in oxygen and expensive. It’s not a slam-dunk into commercial use just yet, though. Ongoing research at IBN aims to find cheap alternatives for the hydrosilane reagent so that the production of methanol can be even more cost-effective for mass industrial production. It certainly does change the perspective on the CO2 output at any facility with a noteworthy volume of CO2 available. In the U.S. for example a power plant having used the base fuel could have a means to use the CO2 effluent for supplying a methanol production substituting a hard investment with a sequestration of CO2 expense compared to an investment that generates an income. Yet these kinds of things will be subjected to the dreadful uncertainty coming from the new U.S. EPA designation of CO2 as a pollutant. Delays are now an absolute certainty with uncertainty being the new watchword. One might think that never has government done such a dumb thing. One would think that everyone would want to endlessly recycle CO2 along with everything else on the planet and open the door wide to reducing fossil fuel use and increase available fuel and energy supplies. Old hands at life in regulated economies know better. The EPA getting into the CO2 business is a disaster, and one of the first victims will be this caliber of innovation and creativity. Whether at the investor level, across the planetary health range or the competition in the costs of fuels are in for lots more delay, innovation stifling, and simply bureaucratic interference. But it could become a boon to those countries with enough intelligence to bypass the global warming hysteria and produce fuel with what’s at hand. The economic framework aside this kind of technology could, if reason overtakes hysteria, generate a great deal of methanol fuel product. Methanol is good stuff, hydrogen rich and tolerable in safety and easy to transport. It’s a potent fuel source for both current combustion technology and the likely fuel cells to come. It will be interesting to see the numbers when the fossil fuel users see the income potential from using the CO2 effluent for fuel product. One hopes the environment crowd understands the importance of reusing the CO2 again. It would be the ultimate irony that just when we figure out how to recycle CO2 into something useful – the EPA would block the process. Once again, sounds like a Monty Python sketch. Unfortunately, the “environment crowd” is only in it for the power and the cash. As for actually helping the environment…well…they never thought of that. They would turn CO2 into methanol and then what? Use it for substitute for petrol. If you burn methanol you also get CO2 right? Where on earth did they find hydrosilane? It it provides hydrogen it would be off to a better use in fuel cells. But anyway the formation of methane consumes just as much energy as burning it provides. And the energy has to come from some place. in todays world…..everything that can be used to reduce globval warming should be used……this is also a good and effective way to do that….in my view its worth trying to do it on a large scale…….someone who has the power,capital,intelligence and capability to do this process on a massive scale should come forward and do it…..
Amazing blog, saved the blog with hopes to read more! Thank you so much for sharing all of the good information! Looking forward to checking out more blogs! Helpful post, saved the site for interest to read more information! Thanks so much for sharing a lot of this awesome information! I am looking forward to reading more blogs! Thanks very much for writing a lot of this awesome info! I am looking forward to reading more. Damn! this is really interesting. Never thougth this matter before but that’s gonna change from now on! thanx! I was browsing the internet checking out some stuff and found your site. I wanted to tell you that I think your site has a nice layout and design and that I have already favorited this site so I don’t lose it good job! Not a good thinking. I accept it is feasible but not good for commercial applications. The science behind is not interesting. It is waste of time to read this paper.